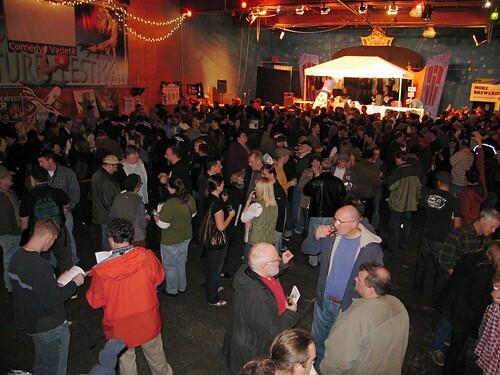 Last year's Winter Beer Fest at Hale's. Thanks to Russ+ for the link. I hope you’ve got your liver ready to go, because there will be plenty of chances to drink good beer this week. Starting tonight, you can head over to Big Time Brewing for their annual release of Old Wooly, which is a potent barleywine. They’ll have the beer on draft, as well as available in 22oz bottles to-go. In the past, they’ve been known to have older vintages available, but I’m not sure if that is the case this year. Naked City Taphouse & Brewery will be hosting a night of tasting stouts and porters on Wednesday. This one snuck by me and I believe it is sold out already. So, why am I telling you about it? So that I am not the only one jealous of those going. Thursday marks the start of the Third Annual Big Wood festival at Brouwer’s Cafe. They will be pouring more wood-aged beer than you’ll know what to do with. You can see the full list on their website, and I’m hoping I’ll get a separate post up tomorrow or Thursday morning with a few gems I plan on targeting (going to be tough to pick). The wood starts pouring on Thursday and some special kegs will kick early, but there will be plenty of good stuff that lasts till Saturday and probably even longer. So, don’t hesitate to stop on by this weekend if you can’t make it Thursday. Also on Thursday, Beveridge Place Pub will host their Noel Especiale Draft Revelry. They will tap some rare holiday treats from around the world, including St Bernardus Christmas, To You, From Mikkeller, Nogne O Winter Ale, DeKoninck Christmas, and Corsendonk Christmas. Starting on Friday, the Washington Beer Commission will present the Winter Beer Festival on December 4th-5th at the Hale’s Palladium at Hale’s Ales Brewery & Pub. This year’s event boasts the biggest beer lineup in its history, with 34 Washington breweries pouring over 80 beers. A wide variety of winter seasonal brews featured at the event range from classic winter warmers, dark and malty stouts, hoppy Northwest style ales to bubbly Belgians and barrel aged gems. I’ll get a separate post up later this week with some details on the beers that will be available, but you can check out their website for a full list as well. Also, for those of you down in Portland, you would be a fool if you don’t head to the Holiday Ale Festival for at least one day this week. They’ll be pouring some very special beers from December 2 to December 6. I’d love to go to this fest one of these years, but it is always the same weekend as Big Wood and Winter Beer Fest the past few years.